The following information was compiled through the Consumer Product Safety Commission, the National Spa and Pool Institute, the National Safety Council, the U.S. Centers for Disease Control and Prevention, and AQUA Magazine, October 1998. Every child can avoid becoming one of these numbers if proper precautions are taken. While it may seem like scare tactics, officials think that statistics may get people to change their behavior and make certain they are exercising safe pool conduct. About 300 children under 5 years old drown yearly in residential swimming pools. The U.S. Consumer Product Safety Commission estimates hospital emergency room treatment is required for another 2,300 children under 5 who were submerged in residential pools. Boys between 1 and 3 years old were the most likely victims of fatal drowning and near-fatal submersions in residential swimming pools. Swimming pool drownings of young children have another particularly insidious features: these are silent deaths. It is unlikely that splashing or screaming will occur to alert a parent or caregiver that a child is in trouble. A toddler drowning in June in Anderson, Ind. didn't wake an adult sleeping near the pool, because the child didn't make any sound. After motor-vehicle related deaths, drowning is the second leading cause of injury death for children (ages 1 - 19 years) accounting for 1,430 deaths in 1992. For children ages 0 - 4 years, drowning is the third leading cause of death! In 1993, drowning rates for every age group were four times greater for males than for females. Drowning rates overall among blacks were twice those of whites. But among persons ages 1 - 4 years, the drowning rate among whites was twice the rate among blacks, largely because of drownings in residential swimming pools, says the CPSC. 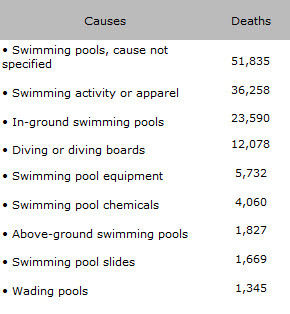 According to the CPSC, each year emergency departments report about 500 drownings and 3,000 near-drownings among children under age 5 years in residential swimming pools. Sixty to 90 percent of drownings among persons ages 0 - 4 years occur in residential pools and more than half of these drownings occur at the child's own home. In-ground pools without complete fencing are 60% more likely to involve drowning than are pools with fencing. So-called isolation pool fences that isolate the pool from the house are recommended by officials. Instruct baby-sitters about potential pool hazards to young children and about the use of protective devices, such as door alarms and latches. 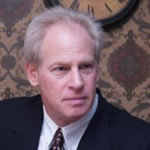 Emphasize the need for constant supervision. Never leave a child unsupervised near a pool. During social gatherings at or near a pool, appoint a "designated watcher" to protect young children from pool accidents. Adults may take turns being the "watcher". Otherwise, adults may become pre-occupied and assume someone else is watching the children. Do not consider young children to be drown-proof because they have had swimming lessons or are wearing a life jacket. Do not use flotation devices, such as water wings, as a substitute for supervision. Learn CPR. Baby-sitters and other caretakers, such as grandparents and older siblings, should also know CPR. Keep CD players, radios, and other electrical devices away from pools or nearby wet surfaces. Stay out of the pool during rain, thunder, and lightning storms. No glass of any kind in the pool area. No running, pushing, wrestling or disturbance in the pool area. No chewing gum permitted in the pool area. Don't let long hair get near a pool outlet. The suction can cause hair or body entrapment and drowning. Have a First Aid kit with resuscitation equipment (i.e. Personal Resuscitation Mask or Personal Resuscitation Shield) and Body Substance Isolation equipment at poolside. No jumping or diving in the shallow area of the pool. Don't allow children to "play" as though they are drowning - a false alarm might delay a rescue in the event of a real emergency. When diving, always enter the water with your arms extended firmly overhead and keep your hands together to protect your head. Never dive in less than 9' of water and always have at least 25' of clearance in front of you before you dive. Diving into shallow water can result in cervical spine injuries causing permanent paralysis. Never dive into an above-ground pool. Avoid the use of alcohol or other drugs around the water.